What do you think about this idea? I love it! Karen snapped this picture at her Price Chopper in Oneonta. Has anyone else seen this at their store? 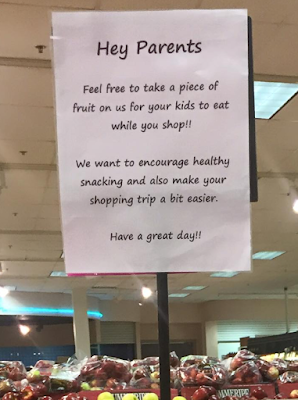 I would love it if my store did this! I'd love to see all grocers adopt this policy! Let's encourage healthy snacks, but also would hope a staffer wouldn't mind washing the fruit for the child first. This is awesome. I'm taking my son Henry tomorrow and he loves entire pineapples.